RUSH: I want to share something with you. This business of Jeff Flake and McCain and any number of other Republican senators who are standing up and voicing their opposition to Trump, their outrage. I shared with you a piece of from Victor Davis Hanson two days ago backing up a theory of mine. There isn’t any disunity in the Republican Party, if you look at the percentage of Republican voters voting for Trump. Trump got 90% of the Republican vote, just like George W. Bush did. Romney got 93%. McCain got 90%. There isn’t any split there in terms of Republican voters. The split is in the establishment. I’ve tried to tell everything that if you look at overall voting records, you really don’t find that big a split in House and Senate Republicans and the way they voted on Trump agenda items. Now, health care is a standalone, the repeal and replace Obamacare. The point that I have been making is the real problem these clowns have with Trump is they don’t like his personality. They think he’s coarse. They think he’s a pig. They think he’s rough around the edges. He’s not collegial. He doesn’t comport himself in the way of sophisticated members of the establishment. TODD: Do you believe this split is over style or is it over substance? You could make a case it’s over both. There’s definitely a pugilism, that Trump style of politics — which was really perfected by Rush Limbaugh, Roger Ailes — that sort of in-your-face, conservative populism that you could say Donald Trump is emblematic of. Is that what you view as the fight inside the Republican Party? Is this a stylistic fight? Is this truly over substance? But let me ask you this: If Donald Trump were more polite, would Jeff Flake still be running and would Bob Corker still be running? Even if he was still a protectionist? Even if he was still an isolationist? I think for now this split appears to be more about style and decorum and character. RUSH: Bingo! Let me tell you what that means. It’s not really that they’re upset. They don’t like fighting back, folks. This nails it again. What makes them nervous is fighting back, and they’re disguising that fear by saying they disagree with Trump’s personality or his pugnaciousness or his tweeting or his barbaric attitude or his bull-in-the-china-shop demeanor. Whatever. That’s just code for they’re uncomfortable fighting back. They’re uncomfortable fighting back, why? Well, they’re afraid of what the media might say about ’em, number one. They’re afraid of what their other sophisticated members of the establishment will say if they start echoing or agreeing with or sounding like Trump. Now, stop and think of what this means, though. Essentially, aside from a couple of outside-the-mainstream examples, most of these guys are pretty much on the same page with Trump issue after issue after issue. I mean, immigration and health care might be two standouts. But they still can’t find their way to openly supporting his agenda because they are made nervous by the way Trump behaves. (impression) “It’s just so unseemly, so unsophisticated, so crude. Ew! It’s just crude, and we don’t like that.” So, in other words, they are from the patsy wing of the party wants to continue to be doormats and at peace. 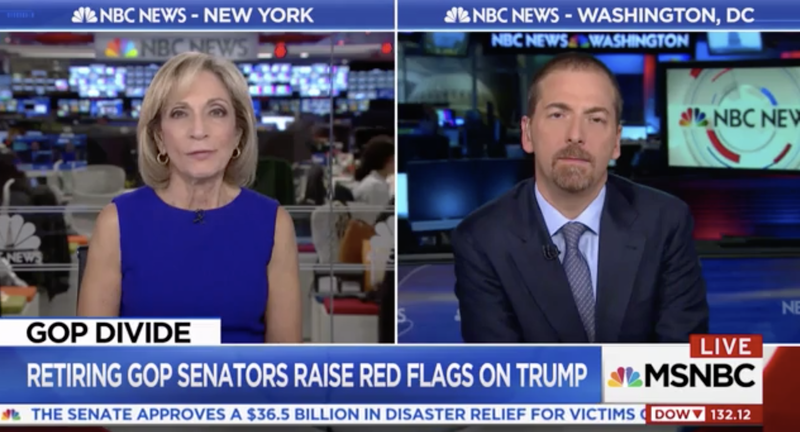 But note, ladies and gentlemen, who is it that, in the eyes of F. Chuck Todd — and if it’s in the eyes of F. Chuck Todd, it’s in the eyes of everybody in the Drive-By Media. Who is responsible for this? Why, yeah, none other than your beloved host (chuckling) the all-knowing, all-caring, all-sensing, all-feeling, all-hearing, all-everything Maha Rushie. If Limbaugh would simply go away or shut up — ’cause we got rid of Ailes. If Limbaugh would shut up and go away then we could turn this whole party back into a bunch of Flakes and Corkers and so forth — except for Trump. So they’re expressing their desire and their wishes and their frustrations and all this. But it how about the…? Strip all that away, and the Drive-By Media here really believes that the reason these guys don’t help move the Trump agenda is simply based on the fact that they don’t like the way Trump operates. So what is important to ’em? Why can’t they get past that? Moving the agenda is the thing. Winning is the thing! Keeping the Democrats on the defensive and in the minority is the thing, and to allow discomfort with Trump’s personality to impede that? It’s kind of odd. But it isn’t if you understand them. It’s mostly unfortunate.